Lawrence Edward "Larry" Page is one of the founders of internet search engine Google. He is currently the President of products at Google Inc. Larry Page was born in East Lansing, Michigan. His father, Carl Page, received his Ph.d. in computer science in 1965 when the field was regarded as "a pioneer in computer science and artificial intelligence." Both he and mother of Larry Page, Gloria, is a Professor of computer science at Michigan State University. Larry Page's mother was Jewish but he was raised without religion. 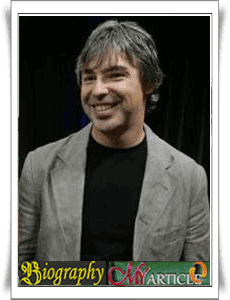 Larry Page attended the Okemos Montessori School now called Montessori Radmoor in Okemos, Michigan in 1975-1979, and graduated from East Lansing High School in 1991. He holds a Bachelor of Science in computer engineering from the University of Michigan with honors and a Master of Science in computer science from Stanford University. While at the University of Michigan, Page creates "an inkjet printer made of Lego bricks" (actually a line plotter), and he also served as the Honorary President of Eta Kappa Nu group in the fall of 1994, and is a member of the "Blue" in Maize & Solar Car team at the University of Michigan. When it became a student in the Ph.d. program in computer science at Stanford University, Page met Sergey Brin. At first they feel is not suitable. This is because of their incompatibility with respect to any topic discussed. However, in the end they have the same interest regarding search engines (search engine). Together, they run the search engine Google, which began operating in 1998. Google is based on the patented PageRank technology, which is based on the structure of links between web sites to rank a particular site. The page still remains on leave from the Ph.d. program While at University, she makes an inkjet print engine from pieces of Lego blocks. Page run Google as President along with Brin until 2001, when they hired Eric Schmidt to become Chairman and CEO of Google. Page now run Google as a triumvirate along with Brin and Schmidt. According to Forbes, Page had an estimated net worth of 12.8 billion US dollars. This makes it one of the richest in the world number 27. In September 2005 he and other Google founder, Sergey Brin, purchased a very large passenger aircraft, a Boeing 767, for their personal use. Page is active investor in alternative energy companies, such as Tesla Motors, which developed the Tesla Roadster, an electric vehicle with a battery range of 244 miles (393 kilometers). He continues to be committed to supporting the technology with renewable energy, and with the help of Google.org, the philanthropic arm of Google, Page suggested the adoption of plug-in hybrid electric cars and other alternative energy investments. In 2002, Page, along with Sergey Brin, named to the MIT Technology Review TR100, as one of the 100 world's best innovators under age 35.